of the considerable damage they can cause. Wool carpets and rugs are most at risk from carpet moth damage as well as any other wool product, as it’s the moth larvae that feeds on the protein from the wool, making the wool extremely weak. We have seen a frightening array of damage by moth over the years, from tiny patches, to whole sections of carpet and rugs. The damage is caused to the wool pile that the larvae weakens by digestion. 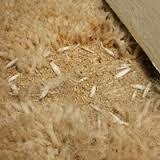 It is common to find pile very easy removed from the carpet or rug, even in seemingly unaffected areas. Ok, so what can you do about this? If the moth are disturbed on a regular basis, then they will very quickly move to another area. So, if you notice any sign of moth damage, no matter how small, this could be the first warning sign of a possible moth infestation somewhere in the property. The first thing to do is to move any large furniture, or any furniture that has not been move for a while, and check for any damage to the carpet pile, moths and/or larvae. It is very easy to spot the damage as you will have very obvious bald patches in the carpet. You may also see the moth flittering in the carpet and even the larvae. The first thing to do is quickly vacuum-up the moth and larvae in the damaged area. There is a chance you may also remove more carpet pile as you vacuum. There is not a lot you can do about this I’m afraid as the damage to the pile has already been done. Just think of it now as damage limitation. After you have gone through the whole property and are satisfied all affected areas have been dealt with, it is then a case of periodic re-checking. As I said above, moth do not like being disturbed, so if you occasionally move the furniture and vacuum, the moth will soon disappear. By the way, please note it is very important to make sure all the larvae is removed before you replace the furniture as you can be very quickly back to square one if and when the larvae hatches. Be sure to look very closely in the carpet pile, as the larvae can dig-in quite deeply. There are insecticide treatments you can buy online and in most DIY stores to treat moth and their larvae. These work on application by spraying the treatments onto the carpet and leaving it to work. You should see evidence of the product working straight away. Although these products do work, you can do the same ‘removal’ job by simple vacuuming, you also need to consider what insecticide chemical you are using and potentially leaving in your carpet. If you have to use insecticide chemicals and don’t have a way of washing them out of the carpet, (like using a big carpet cleaning machine) I would suggest to only use the chemicals in areas behind furniture, ensuring they won’t come into contact with your or anyone’s skin once the furniture is replaced. You can also get this done for you by using a company like us. We have treatments and processes that remove the moth and larvae and can prevent them from returning. We applying very safe protecting treatment to the carpet after moth and larvae have been removed by us and cleaning. You can also contact pest control companies.